After months of speculation China finally announced that it is has started to assemble the Jiaolong (Water Dragon) AG600 – the world’s largest amphibious aircraft, according to the International Business Times. The first airframe is currently being constructed at a facility in Zhuhai in Guangdong province. Final assembly should be completed by the end of 2015 with a first flight tentatively scheduled for mid-2016. Government sources report that an order for 17 planes has already been placed domestically. As I reported before (See: “Will This Plane Let China Control the South China Sea?”), the AG600 is capable of landing and taking off on water (and land) and could make it easier for Beijing to press its claims in the South China Sea. Amphibious planes like the AG600 would be perfect for resupplying the new artificial islands that the Chinese are building in the SCS [South China Sea]. At the same time, these islands would be excellent bases of operations for the AG600 to engage in maritime patrols of claimed territories. However, an official in the Chinese aviation industry stressed that the plane is also intended for export abroad. “Since the first day of its development, the AG-600 has been designed for the global market. We are confident in its market prospects because the aircraft’s overall specifications, such as the maximum take-off weight and flight range, are better than other amphibious planes in the world,” said Qu Jingwen, general manager of the China Aviation Industry General Aircraft Company. The aircraft is powered by four turboprop WJ-6 engines and has a range of 5,500 kilometers. It has a maximum take-off weight of 60 tons and can carry up to 50 people. A few potential foreign customers have allegedly already sent purchasing inquiries. “Some countries with many islands, such as Malaysia and New Zealand, have expressed interest in the AG-600, and we are in contact with them,” Qu noted. However, one analyst is not so sure about the plane’s export potential. “Since the program can hardly be justified by the civilian demand, the likely explanation is that the program has a significant military importance,” Sam Bateman, an adviser with the Maritime Security Program at the S. Rajaratnam School of International Studies in Singapore emphasized. There’s always a golden rescue time for survivors in the open sea. The time limit is usually controlled in seven to 12 hours, but the speed of the rescue boat is too slow. The cruise speed of this seaplane is 480kms per hour. If other conditions allow, the seaplane can land directly on the water surface, and then send out lifeboats. In this way we could conduct a successful rescue. This statement should still be taken with a grain of salt. It is highly unlikely that such a plane could be deployed in the open oceans for rescue operations due to high waves and strong currents. 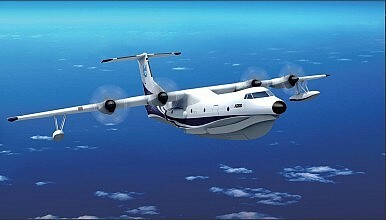 It will much more likely be used as a military or civilian transport aircraft in shallower waters. In that sense, it is ideally suited for deployment around the contested Spratly Islands in the South China Sea.